. Today, we are launching Google App Engine and Google Cloud Datastore in the new region in beta. us-east1 colocates App Engine, Cloud Datastore, and other Cloud Platform services, making communication between services faster, while offering high availability of App Engine and Cloud Datastore across multiple zones. If you’re interested in building solutions that use App Engine in conjunction with Compute Engine or Cloud Storage, or if you’d like the latency of your Cloud Datastore writes to benefit from having all replicas in close proximity to one another, this is big news. To get started, simply open up the Developers Console and create a new project, specifying the location as us-east1. Note that once a project is created, its region cannot be changed. To learn more about the services offered in each location, as well as best practices for deploying your applications and saving your data across different regions and zones, check out our Cloud Datacenter Locations and Geography and Regions pages. Recently we announced that Google Cloud Platform is now closer to more people and businesses with the opening of the new us-east1 region in South Carolina. 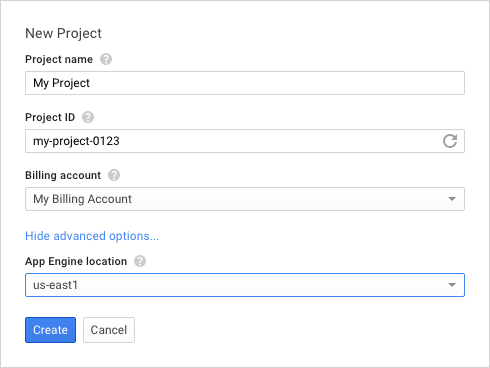 Today, we are launching Google App Engine and Google Cloud Datastore in the new region in beta.